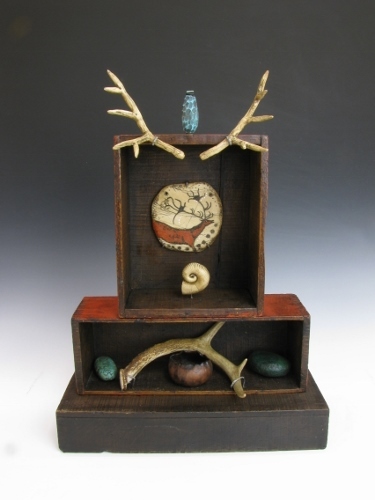 Luann Udell is a mixed media artist inspired by prehistoric cave art, especially the Lascaux Cave in France. See more of her polymer clay “ancient” art by visiting her website. We know so little about those artists of prehistory. Yet they had the same human needs, drives, desires, and fears that shape our world today—our need to belong, our need to be seen as an individual, our fear of “the other.” The power of our choices also shape who we love, how we live, how we cope with loss, and how we face our death. As a woman born mid-century, I saw few women making art throughout history. So I created this place, this story, for myself. By finding my place in the world, I made work that speaks to others, too. Decades later, science and history have caught up. Now we can see those “invisible” women artists, along with artists of other color, and other cultures. My artifacts began as embellishment for fiber pieces. I wanted them to look truly ancient, to be authentic, not through blind reproduction, but by diligence and attention to detail. I use a faux ivory polymer clay technique similar to Samurai sword-making, to imitate the grain of real ivory. I shape each animal one at a time, by hand. My horses’ legs and tails are broken off, like real prehistoric artifacts (unknown to me at the time.) Domestic animals such as horses and dogs often carry my hand print as a miniaturized version of my own hand – but not the wild ones. I use a scrimshaw technique to bring out the markings. I hand sand and buff each one, to look like they’ve been polished by the constant touch of human hands. It’s a time-consuming process, but it’s important to me, and it works. New animals appear, seemingly with no rhyme or reason. Looking back, I see each appearance coincides with a period of great change or insight. They carry that story. People are often drawn to one animal over another. When I share the story, they say it makes perfect sense to them. The piece becomes their personal totem. I thought I would outgrow these stories. But the stories grow, and change, as I do. My art has been healing for me, and for others, in ways I often don’t understand. I write about this often, because I believe it’s the ultimate power of art—to restore us to ourselves spiritually and emotionally, so we can participate more fully in the world. If that helps others along the way, then we’ve truly found our place in the world. Artist Luann Udell invites you to follow her on Facebook, Twitter and her blog. I love them! Can’t wait until her shop reopens. Your wish, is granted, Jessica! I just opened it a bit ago. lu Ann, I love your work! Come to Ashland Oregon some time and let one of our galleries show your fantastic work. Smile. Andre, so kind of you to suggest that! I will investigate.